BAIE BOTANIQUE SKINCARE REVIEW. - CRUELTY-FREE BECKY. Kicking off March Madness (came up with that name myself) in true style, I thought I'd review some skincare. 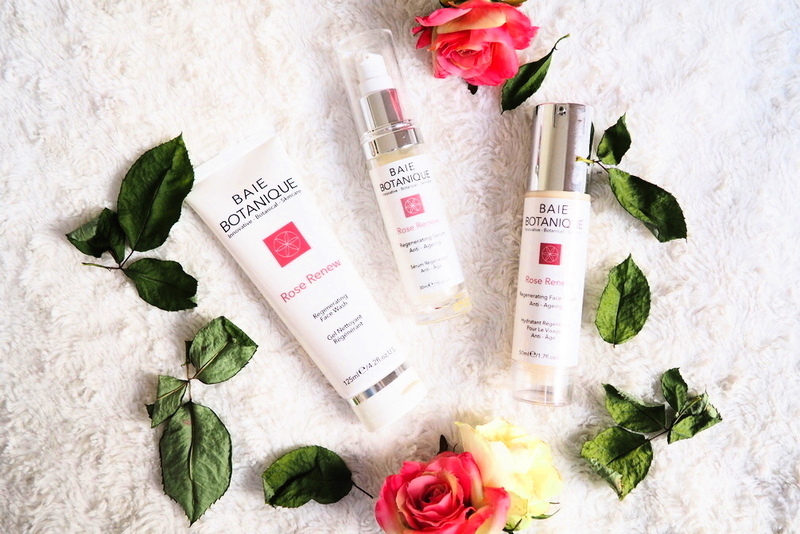 I'd like to make it very plainly clear that I was sent these products from the Baie Botanique Rose Renew Range - I never get sent products, but always thought that if I were to then I'd make it very very clear that they were not purchased with my own money. No time for shadiness here. Interestingly, I actually ended up judging the products more harshly than I'd anticipated due to the fact that I didn't buy them myself. Maybe I should make one of those fancy disclaimers for my blog but, as I say, I don't get sent products. ANYWAY let's skip to the good bit. BRAND Baie Botanique - a brand created by a professional with years of experience in the beauty industry with products made in wind powered eco-labs by an all female team. Girl power + renewables. Lots of love. CRUELTY-FREE Of course. Approved by PETA. VEGAN Yes. The entire range is void of any animal derived ingredients. That's what we like to hear. INGREDIENTS At least 70% organic across the three products and mostly natural. They do however contain preservatives in the form of Potassium Sorbate and Sodium Benzoate in places. Bear this in mind if you're sensitive to these or wish to avoid them. SCENT These are heavily scented of rose - a smell that seems to be a dividing force in the beauty world. Some absolutely love it, others think it smells like granny soap and absolutely hate it. Me? I tend to like it - as long as it's authentically fragranced and not fake-smelling. Lucky for me, this range is free from synthetic fragrance and smells like natural rose. Although I like the smell, I figure that this is something to note for those of you who are sensitive to scent, though the smell doesn't seem to linger for long on the skin so it shouldn't be a problem even if you are rose-averse. PACKAGING Come packaged in recyclable cardboard boxes which feel really luxurious and soft to the touch. Might sound a little random to make a point of, but I just think it makes the product seem that touch more fancy and would make the perfect present to give as a gift. The actual product packaging is plastic and lightweight, but sturdy and secure. I love the pump on the Face Cream which means you don't have to dunk your hand into a pot and spread germies. PRICE The Rose Renew Range is not particularly cheap, ranging from £16-£34, but if you're someone who likes to invest in natural skincare then this range could be for you. FACE WASH Dispensed as a gel, this lathers up really nicely into a silky soft bubbly wash. It leaves the skin quite tight but not overly stripped. Make sure you follow up with a serum and cream to ensure the hydration is put back into your skin. SERUM Thicker than what I'm used to because I usually opt for a serum-oil at this stage of my skincare routine. Regardless, I have been enjoying using this and feel that it absorbs nicely into the skin. FACE CREAM This cream is lovely and very gentle on sensitive skin. I can happily rub it around my sensitive eyes without it stinging or irritating them, which is amazing. For reference, I have normal/dry sensitive skin prone to redness. Two pumps is generally enough for the entire face - maybe three if you wish to moisturise the neck as well. This cream is void of any SPF so make sure you pair it with some sun protection - especially because it also contains glycolic acid and hyaluronic acid to increase cell turnover and skin firmness. As always with products that claim to be anti-aging, the claims are hard to accurately report back on because it's not really possible to test against a control. But it sits nicely under make-up and is nourishing enough to be used as a night cream as well. This is probably my favourite thing I've tried from the range. So there we go. Hope that was a little bit helpful if you're looking into purchasing any of these. I'm pretty keen to try out their eye cream (currently out of stock) because the face cream is so gentle and kind to sensitive areas that I think that a more indulgent version would go down a treat. I also hope they expand their line to a toner or face mist. At the moment I'm using these products in conjuction with my Minimal Cosmetics Pure Rosewater spray, but a product from the brand itself would be amazing. Oh and maybe an exfoliant or gentle scrub. Basically: I want it all and can't wait to see where the brand takes their range in the future. Have you tried anything from Baie Botanique? Thoughts?